The Regrettes came through, and blitzed the Black Cat’s Backstage! Before a sold out Cat crowd, the California garage punk band put on a fiery show and left everyone in the Backstage clamoring for more. The Regrettes formed in 2015, and are now touring after releasing their debut studio album, Feel Your Feelings Fool!. I’d say it’s aptly titled, as there were certainly emotions visible on the faces of those experiencing the sometimes pop, often punk parade of songs. Not a few people were grinning like fools (presumably). They began their tight 40-minute 11-song set with “I Dont Like You” before playing two of their best songs from Fool!. “Hey Now” is a catchy come on we all need, while “Come Through” is the break-up after you’ve discovered that partner is too unreliable. 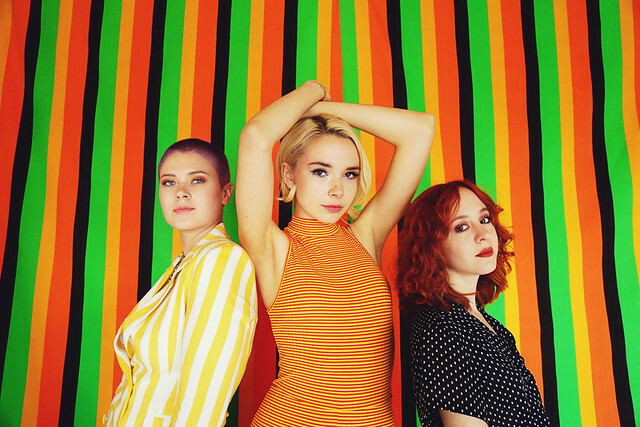 The Regrettes is Lydia Night (vocals, guitar), Genessa Gariano (guitar), Sage Chavis (bass) and a new member Drew Thompson (drums). Next came “Picture Perfect”, which led with an epic rock intro with all guitars blazing, and later saw Lydia flash down to the floor, pink hair a blur of motion as her guitar continued its serious workout in a sea of dancing humanity. Lydia shared about their touristic inclinations in DC, that they visited the National Museum of Natural History and noticed all the young kids wearing MAGA hats. In contrast, she was excited to be playing in DC to a room of young minds that aren’t hateful. It was an accurate observation, smiles and love for the band were in abundance. They ended with a cover of “The Ballroom Blitz” and again Lydia dropped to the main floor to shred her guitar with the locals. As they each walked off stage the applause was genuine and went on and on. No one was clear on the concept it was really over, without an encore, until a staff member came over to turn on the lights to a burst of boos (mostly mine). A stop at the merch table to acquire a copy of Fool! was necessary, so the wait for their next show in DC should be less painful. You can also catch them perform live at Firefly Music Festival 2018.